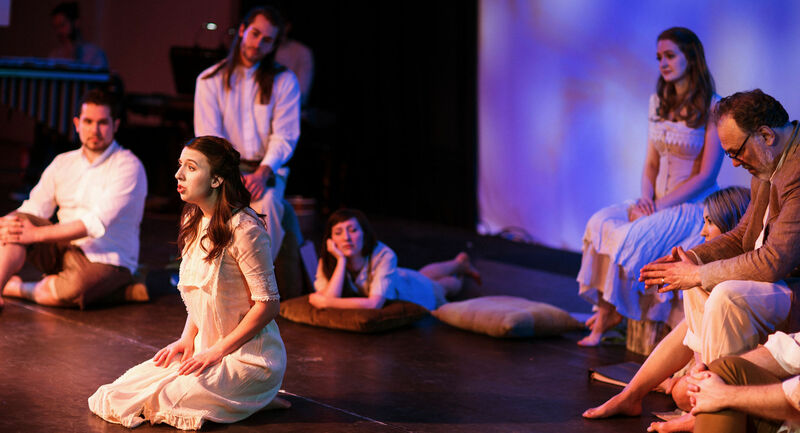 Christine Wade (2nd from right) plays the ukelele as Krin McMillen, Thomas Friebe, Maggie Burr, Zach Garcia, and Anna Hashizume look on in Theatre Elision’s production Of Art and Artists. Photo by Jessica Holleque. Theatre Elision’s Of Art and Artists program, which opened last night in Eden Prairie, is the sort of show that doesn’t fit in a standard-sized box. Is it a poetry reading? An art salon? A musical concert with some filler and dance interludes? Elements of each are interwoven into a 70-minute performance that leans most heavily towards the poetry. Read an interview with Maggie Burr and Jim Ahrens from Of Art and Artists. Poetry is not a bad focus for evaluation, given that the through-thread for the evening is the poetry of Amy Lowell (1874-1925), the fourth woman to receive the Pulitzer Prize in Poetry. Judged as a poetry reading, Of Art and Artists is a dynamic, innovative, and interesting way of presenting poetry through multiple mediums. The readings are sometimes recitation, sometimes monologues, and sometimes sung music. One is delivered as a rap, some come with dance, and according to the design some should be paired with projected visual art – the latter element being absent on opening night due to a technical issue. Above: A scene from Of Art and Artists, recalling Anselm Feuerbach and others’ depictions of Plato’s Symposium (1869, below). The works of Plato were a core part of Amy Lowell’s early literary education. Photo by Jessica Holleque. The general format of the evening has a vibe akin to a symposium in the classical Greek sense, without there being an actual exchange of dialogue. (Some lines are split back-and-forth between the ensemble.) One poem transitions smoothly into the other, and it’s often hard to tell where they begin and end – so you might find yourself reading some of Lowell’s beautiful poetry later, just to figure out what a favorite segment is actually titled. The vocal music sections spring organically out of this array, and showcase a very diverse array of song settings by mostly female composers: Mog Fry, Jennifer Higdon, Libby Larsen, Marilyn Mazur, Missy Mazzoli, Meredith Monk, Agnes Obel, Nkeiru Okoye, Caroline Shaw, and Julia Wolfe. 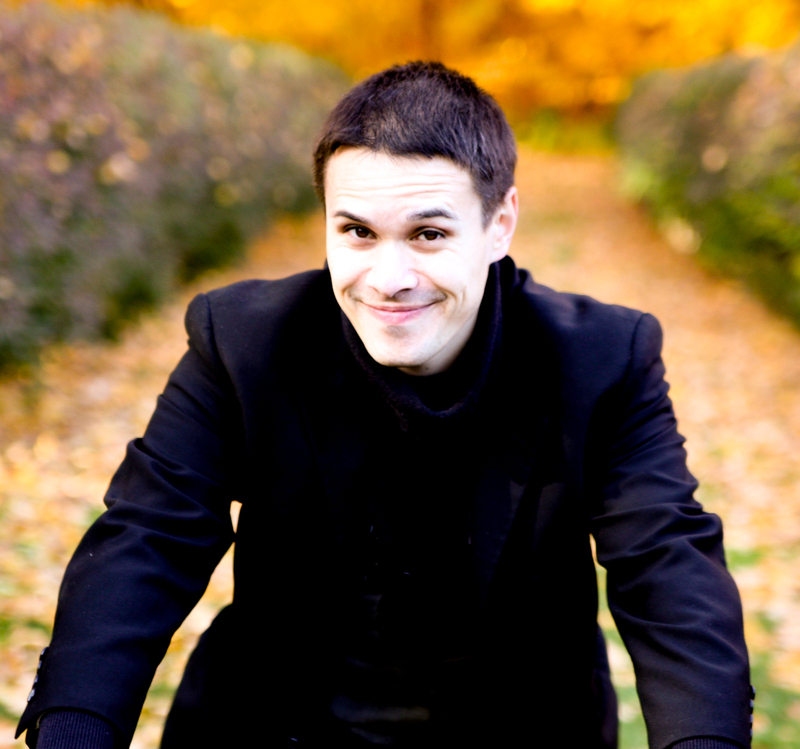 Male composers’ works – by Ben Moore, Steve Reich, Ivan Trevino, and Harrison Wade (also the show’s music director/pianist) – are in the distinct minority, which is thematically appropriate for this program. For a program focused primarily on a single poet from Brookline, Massachusetts, the musical and other variety is impressive. The selected song settings include devices such as 8-part vocal writing, overtone singing, familiar and more distant harmonies, and more. The selected poems (some of which are only read as tailored excerpts) elegantly showcase Lowell’s depth and breadth, for which the oft-applied imagist doesn’t do her due justice. The rough spots – mainly a conspicuous balance issue in the men’s section, a keyboard amp set painfully loud, plus the redundant elements – do not change this very pleasing excursion through the work of poet well-deserving – and rewarding – the attention. Theatre Elision’s production Of Art and Artists plays through April 7 at the Performing Institute of Minnesota Arts High School in Eden Prairie, MN.